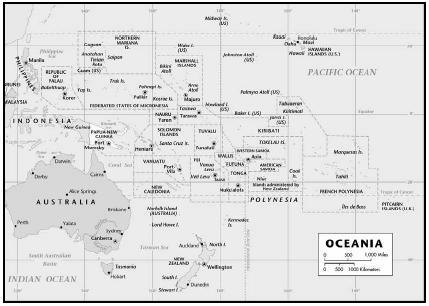 There are thousands of islands in the South Pacific Ocean. Some island groups are independent nations, others are territories or dependencies of the United States, France, and the United Kingdom. 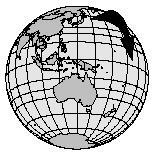 The island groups are categorized as Polynesia, Melanesia, and Micronesia. Polynesia includes the U.S. state, Hawaii, along with New Zealand, Easter Island, Tonga, Tahiti, and other islands. Melanesia includes Papua New Guinea, Vanuatu, New Caledonia, the Solomon Islands, and their surrounding islands. Micronesians inhabit about 2,500 islands that make up the countries Kiribati, Federated States of Micronesia, Palau, Republic of the Marshall Islands, and Northern Mariana Islands. The islands of Fiji are volcanic, with rugged peaks. The environmental conditions on the islands of the Pacific Ocean support seafood and lush tropical vegetation. The first inhabitants on the islands of the Pacific came from Southeast Asia more than 20,000 years ago. They were hunters and gatherers who depended on the plentiful supply of seafood from the ocean that surrounded them. They became known for the great fishing skills they developed. brought with them included dogs, chickens, and pigs. Explorers from Europe in the 1500s brought more new foods to the islands. These included carrots, potatoes, turnips, beef cattle, and sheep. It took a long time until the Western world showed serious interest in the Pacific Islands. By 1900, however, the United States, France, Germany, and Britain all claimed control of islands in the Pacific. Over time, they made a lasting impact on the food customs of the islands they controlled. Cooking styles on the island of Tahiti, for example, continue to reflect a strong French influence. Seafood, particularly fish, has long been the primary dietary staple and source of protein for Pacific Islanders. Nearly 300 varieties of fish are found in the waters of Polynesia alone. Fish is typically eaten raw, poached, or grilled. Root vegetables and tubers, such as taro (also known as a cocoyam), sweet potatoes, and yams, are also central to the diet of the region. A wide variety of tropical fruits are also eaten in large quantities. These include bananas, plantains (similar bananas), mangoes, papayas, and pineapples. One dish that is uniquely Hawaiian is poi, made from the taro root. Traditionally, the root was roasted in an underground pit filled with hot coals for several hours, and then pounded with a stone to make a sticky paste. By adding water, the pudding-like poi was created. Hawaiians ate poi by the bowlful, using only fingers to scoop it up. The coconut, a common fruit grown in tropical regions, is a main dietary staple. Nearly all of the Pacific islanders use coconut milk as their main cooking ingredient. The starchy fruit of the breadfruit tree is another Pacific island staple. When it is cooked, it has a texture like bread (which is how the tree got its name). It can be peeled and eaten whole or mashed into a paste that is dipped into warm coconut milk. The most commonly used spice in the Pacific islands is soy sauce. Gallon containers of it can be found in many households. Introduced by Westerners, corned beef and Spam (canned meat, usually of chopped pork) have become very popular throughout the region. Popular beverages include coconut milk and beer. In a blender (or food processor fitted with the metal blade), process the coconut and hot water for about 2 minutes. Let cool for 5 minutes. Strain the mixture through a coffee filter into a small bowl, pressing down hard on the solid grated coconut flesh to squeeze out all the liquid. For thinner milk, add a little more water. Use immediately in any recipe calling for coconut milk. 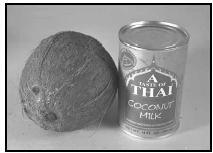 Canned coconut milk, widely available in supermarkets, may be substituted for freshly made coconut milk. Fresh coconut milk should be used immediately, since it loses its flavor even if refrigerated. With help from an adult, use a metal skewer or ice pick to pierce two of the soft spots at the top, where the "eyes" are. Drain the liquid and save to use in other recipes. Place the coconut on a cookie sheet and bake for 15 minutes. Remove from oven and let it cool until it can be handled (about 5 minutes). If it is not already cracked open, place the coconut on a hard surface and tap with a hammer until the shell breaks. Remove the white flesh with a spoon or table knife. Peel off the thin, brown inner skin with a vegetable peeler. 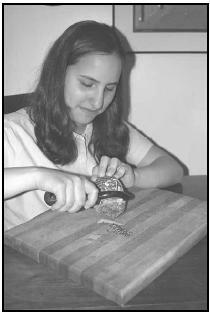 Grate the coconut pieces on the fine side of a manual grater or cut into coarse pieces and grind in a food processor. Use the grated coconut to make coconut milk (recipe follows), as a garnish for fruit salad or ice cream, or in other recipes. 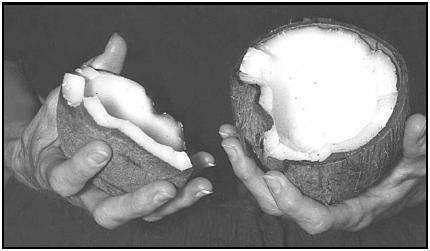 After baking, the hard shell of the coconut often cracks open. If the oven's heat didn't crack the shell, it can be broken open easily by striking with a hammer or rolling pin. The name of this dish is pronounced "PWAH-sun croo." Cut the tuna into ½-inch thick strips about 2 inches long. In a large bowl (preferably glass or stainless steal) combine the lime juice, coconut milk, and salt; stir to mix. Add the tuna, carrot, cucumber, tomato, green onions, chives, and lime zest. Stir to mix. The lime juice "cooks" the fish. Taste for seasoning. Pacific Islanders are known for their love of enormous feasts. They hold feasts to celebrate saints' days, births, marriages, and local events such as the crowning of a new chief. There are also funeral feasts. A typical feast might include cooked fish and shellfish and barbecued chicken or pork (or both). Also served are a wide variety of dishes made from taro (also known as cocoyam), sweet potatoes, yams, bananas, plantains, and coconuts. Many Pacific Islanders are Christians and celebrate the major Christian holidays, including Christmas and Easter. Some Catholics fast (do not eat or drink) during the day or give up certain foods for Lent. Roast pig is a popular dish for Christmas dinner. Buddhism and Hinduism are also found in the region. Fiji, which has a large Indian population, observes Hindu festivals. Sweets are eaten on Diwali, the Hindu new year. Place pork roast in roasting pan or baking pan, and set aside. In a small mixing bowl, mix brown sugar, soy sauce, molasses, garlic, water, and salt and pepper. Pour mixture over meat and refrigerate. Let the meat marinate (soak) in the liquid for 4 hours, turning it occasionally. Roast the pork for 15 minutes, then reduce heat to 325°F. Carve into slices and serve with Bananas and Sweet Potatoes (recipe follows) or other side dish. Scrub the sweet potatoes. Place them in a large saucepan, cover with water, and simmer until soft (about 20 minutes). When cool enough to handle, peel the sweet potatoes and cut into 2-inch thick pieces. Set aside. Melt 3 Tablespoons butter or margarine in large skillet over medium heat. Add bananas and fry, turning often, until well coated and heated through (about 5 minutes). Add sweet potatoes, toss carefully to coat, and heat through, about 5 minutes. Serve as a side dish with Roast Pork (see preceeding recipe) or grilled meat. In a medium saucepan, combine vanilla pudding mix, sugar, and evaporated milk. Stirring constantly, bring to a boil. Cook over medium heat for 2 minutes. Remove from heat, add cardamom, almond extract, and almonds, and stir. Return to heat and cook for 2 more minutes until thickened, stirring frequently. (Mixture darkens to a tan color as it cooks.) Transfer to buttered 8-inch pan and smooth the top with a knife or plastic batter scraper. Cool to room temperature and refrigerate for about 4 hours. Cut into squares. In a frying pan, heat the olive oil and cook chicken cubes over high heat until they are almost cooked (about 5 minutes). Add the chopped onion and cook until the onion becomes clear, about 5 minutes. Add the papaya slices and cook for 5 more minutes. Remove mixture from heat and add the coconut milk. Mealtime customs vary among the many different nationalities and ethnic groups of the Pacific Islands. For example, dinner is the main meal of the day for Tahitians of Chinese and Polynesian descent. However, those of European descent eat their most significant meal at lunchtime. Pacific Island feasts are gala occasions that can be enjoyed by family, friends, or an entire village. Music is usually played while the food is eaten. Instead of a table, bowls and baskets of food may be laid out on mats or on a carpet of banana leaves. The taro root is grown all over the Pacific region, but Hawaiians are the only ones who pound it into the pudding-like dish called poi. Other islanders grate it or roast it to add to stews and similar dishes. twigs. The food is wrapped in banana leaves and placed on top of the heated stones. Then it is covered with more layers of banana leaves and other materials to keep the heat in while it cooks. Once the food has finished cooking, it is taken out of the pit and removed from its wrapping of leaves. Pacific Islanders typically eat with their fingers. Sunday dinners and meals for other special occasions are often cooked in these underground ovens. Arrange the peeled papaya halves, cut side up, in a baking dish. 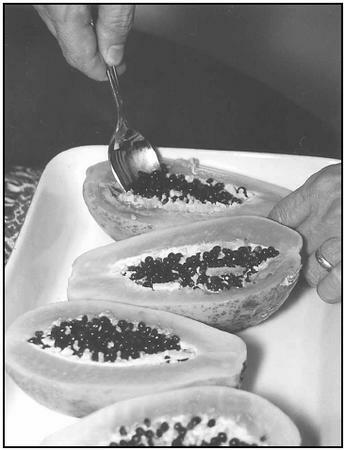 Scoop out the seeds before baking the papaya dessert. Slice the mango (if using) into bite-size pieces and place with banana slices in a medium-size bowl. Add the shredded coconut and stir well with a spoon. Scoop into dessert bowls and serve. Place ingredients in blender and blend until smooth and creamy. Serve immediately. Mix the flour and dry yeast. Add water and mix to form a soft dough. Add sugar and let rise 4 to 5 hours. Divide the dough into about 12 to 15 pieces. Pull them into "ropes" and twist to form figure eights. Fry in very hot peanut oil until golden. Roll in sugar after frying. Place the papayas, cut side up, in a shallow baking dish. Sprinkle with the sugar and add the water. Bake uncovered in the middle of the oven for 1½ hours, or until the papayas are tender but still keep their shape. Every half hour, pull out the oven rack and baste the papayas with the liquid from the dish (pour it over them with a spoon). Raise the heat to 400°F and bake until the syrup gets thick and becomes the color of caramel, about 5 minutes. Turn off heat and pour the coconut milk into the center of the papayas. Leave them in the oven until the milk gets warm, about 5 minutes. Serve immediately, or refrigerate and serve cold. The islands of the Pacific Ocean enjoy beautiful scenery and tropical climates. However, the people living in these island nations are vulnerable to catastrophic weather, such as intense cyclones, droughts, and even more serious, global warming. While there is still much debate about global warming among scientists, serious consequences could result. The islands' economies are adversely affected when shoreline and coastal buildings are damaged or destroyed by cyclones. Crops fail and fishing catches decline during periods of drought. Cyclones and droughts also contribute to the deterioration of coral reefs and to the spread of diseases like malaria and dengue fever. Davidson, Alan. The Oxford Companion to Food . Oxford: Oxford University Press, 1999. Goodwin, Bill. Frommer's South Pacific . New York: IDG Books, 2000. NgCheong-Lum, Roseline. Tahiti: Cultures of the World . New York: Marshall Cavendish Corporation, 1997. Webb, Lois Sinaiko . Holidays of the World Cookbook for Students . Phoenix: Oryx Press, 1995. InternetFiji.com. [Online] Available http://www.internetfiji.com (accessed April 15, 2001). SimplySeafood.com. [Online] Available http://www.simplyseafood.com (accessed April 15, 2001). TravelCafe. [Online] Available http://www.travelcafe.tv/rec_home.html (accessed April 15, 2001).